Since 2003, Slowmo has built up a substantial knowledge of filming ballistic and munitions trials at high speed having worked on many occasions for major Defence/Ordnance companies and ranges. The work is largely UK based but we can cover trials in mainland Europe and the US on request. 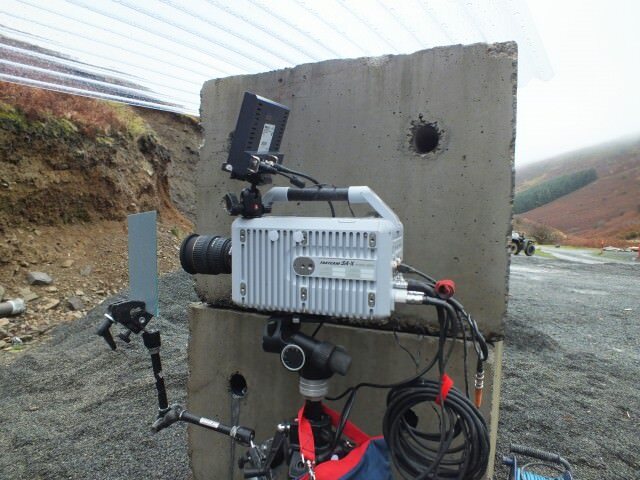 Since 2007, Slowmo has covered the high speed camera requirements at Radnor Ranges filming all types of ballistics and munitions testing for defence, blast protection and engineering companies. We are currently used by major defence companies such as General Dynamics, Lockheed Martin, Leonardo and QinetiQ. In addition to defence work, Slowmo has filmed several demolitions of large structures such as power stations, cooling towers and tower blocks. This application requires a similar approach as it involves explosives, unsafe locations and the ability to operate cameras from distance. Mark Johnson from Slowmo has SC Security Clearance. A showreel demonstrating Slowmo’s extensive experience in filming bullets, projectiles, weapon deployment and associated target effects. A showreel highlighting Slowmo’s filming skills in capturing explosive events, blasts, shockwaves and their effects on vehicles, buildings and equipment. 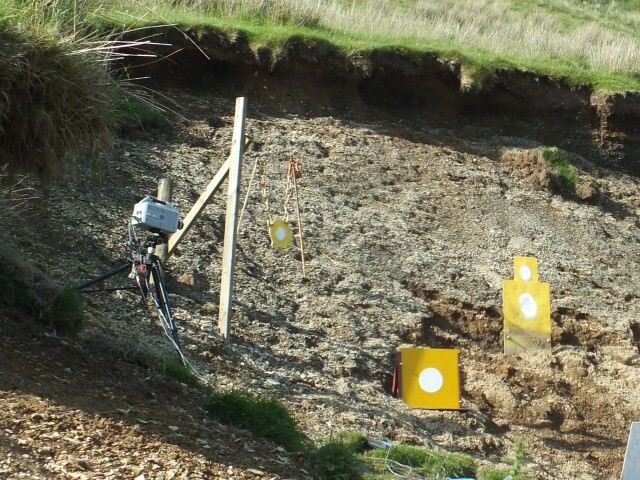 For high speed filming of ballistics and munitions, our experience enables us to select the optimum frame rate (up to 1,000,000 fps), the correct exposure taking into consideration the actual blast/projectile, and optimal camera placement to achieve the best possible detail with camera safety in mind. Slowmo can provide multiple high speed cameras all of which can be triggered remotely from distance. RPGs, shape charges, bullets, missiles (included sea-based trials) and the effect of penetration through various materials have all been filmed in slow motion. Projectile velocities can be accurately calculated within minutes of the trial finishing. High speed footage captured by Slowmo has been shown at Defence exhibitions all over the world and was very well received on its stand at DSEI 2015. In addition, Slowmo has recorded footage for ITN/C4/NBC news on the effect of on-board plane explosions. Slowmo has both colour (1x) and mono versions (2x) of the Photron SA-X2 high speed camera. This camera took the high speed filming of ballistics and munitions to the next level. It offers exceptional resolution and light sensitivity at ultra-high frame rates. The SAX2 mono cameras are ideal for indoor ballistics work and can use the Dual Slope Shutter mode to maintain detail when filming explosions. The new AX-100 and the Photron SA1.1 are used to supplement the SA-X2 cameras on multi-camera shoots. 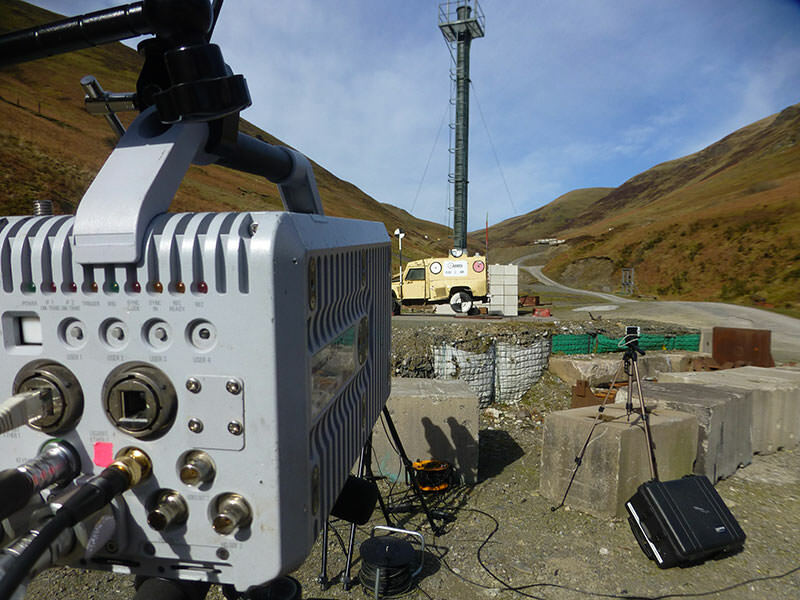 The Photron AX-100 and the Photron SA3 are both compact systems and Hi-G rated and are used to capture on-board images from vehicles undergoing blast/IED testing. Corporate videos showing defence based products and equipment are an important promotional tool for defence companies. The Photron BC2 HD camera can provide the necessary high definition colour images up to 2000fps. Slowmo has the scope to provide up to 3 HD cameras covering a single event. Over the years Slowmo has customised its equipment especially for working on exposed ranges. Each camera can be powered from 24V batteries or with its own UPS unit which will maintain power should there be a loss of mains voltage. Triggering can be performed in a variety of ways (wireless remote, manual switch, TTL signal, impact shock or a change in image) and from distances > 1km away. A GPS timecode (IRIG-B) can be added for synchronisation purposes. Slowmo has a 4 wheel drive vehicle which helps to gain access to remote locations especially in bad weather. We are familiar with trials H&S and have our own PPE and walkie talkies. High speed images were required showing the terminal effects of different AP rounds on metal plates, fired from a distance of 550m, There were 15 firings in 7 series of trials. Trial site regulations meant that no-one could be forward of the rifle. 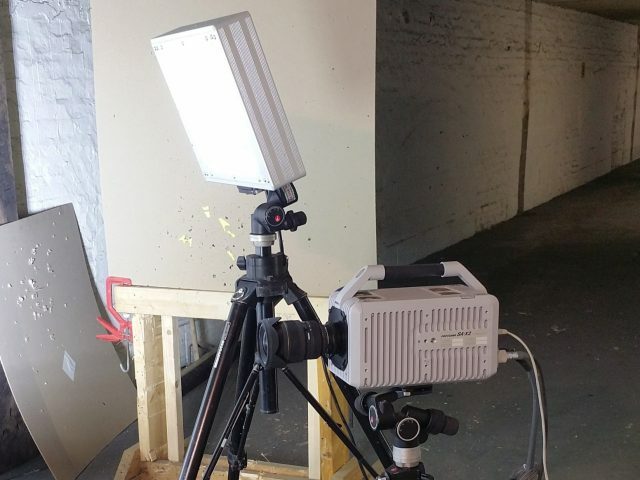 Phil Gotts from PGC Ltd hired Slowmo to provide high speed images for a series of firings testing the bullet impact properties of ceramic tiles as used in personal body armour. Requirement was to capture the detonation and form of different shape charges over several trials. 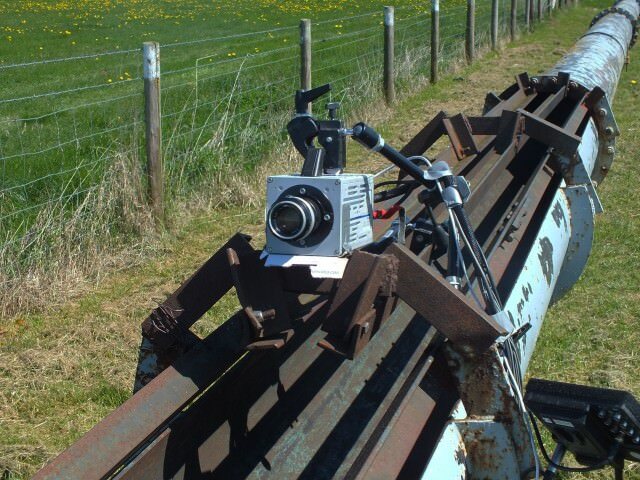 In all over 50 separate firings were recorded using 3 Photron high speed cameras. The location was the main arena at Radnor Ranges. Slowmo Ltd was asked to provide a high speed camera provision for a series of trials taking place over a time period of around 18 months. The test location was the Flare Test Track at COTEC, Wiltshire.